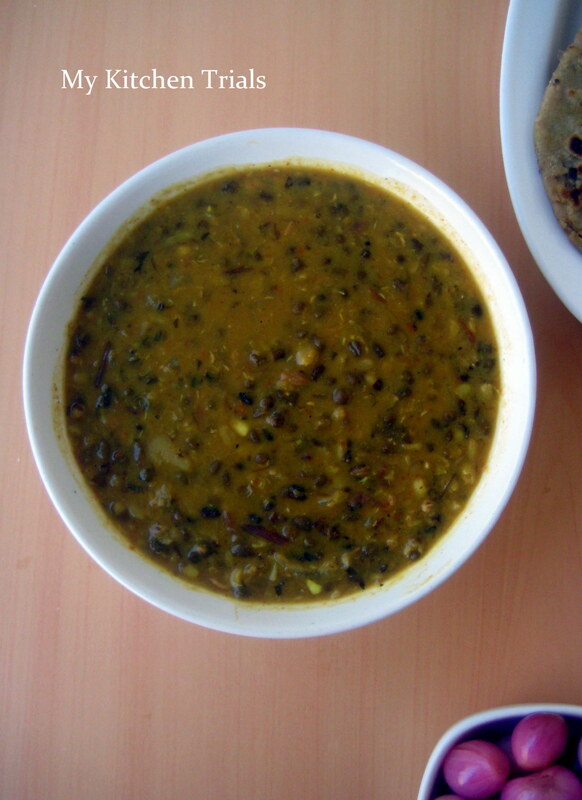 There was this packet of black Urad dal sitting in the pantry for a long time. I have bought it with an idea of making Dal Makhni. So when I spotted the recipe in Preeti’s space, who is my BM partner for the last week of Blogging Marathon, I didn’t delay any further. The dals were soaked and pressure cooked. I chopped the onions and was checking for the chilies when it dawned on me that I was out of green chilies! And tomatoes. And ginger. And chili powder. And coriander powder. And cumin seeds. And coriander leaves, while we are at it. Ok, so it was time for grocery shopping and I was lagging behind. But with the dal in the pressure cooker and no shops anywhere in a 6 km radius, I had to act quickly. I reached out for the sambar powder (I hadn’t run out of that, thankfully!) and added it to the curry. It tasted decent, though not authentic. Well, how can it be, without tomatoes and chilies or any of the flavors, that make it what it is!? Anyway, noting down the original recipe here. And please check your pantry and the fridge before you start cooking this :)! Wash and soak the dals in water for 6-8 hours or overnight. Add salt and enough water to cover the lentils and then pressure cook for a whistle. Then lower the heat to sim and cook further for about 10 minutes. The dals need to be cooked until they are really soft to touch. Finely chop the onions, green chilies, ginger and garlic. Chop one tomato and puree the other one. Heat a tablespoon of ghee in a pan, add the cumin seeds. When they crackle, add the onions, chilies, ginger and garlic. Saute till it turns pink. Add the tomatoes, chili powder, coriander powder, salt, half a tsp of turmeric powder and kasuri methi. Cook for 2-3 minutes and add the pureed tomatoes. Cook for a further 3 minutes. Add the cooked dals and the milk and a cup of water. Add more water and bring it to the consistency you prefer. Bring to a boil and check/adjust the seasonings. Simmer for about 10-15 minutes. Serve hot, garnished with coriander leaves and dotted with butter/cream. Nutritious and droolworthy Dal makhani, simply drooling here. 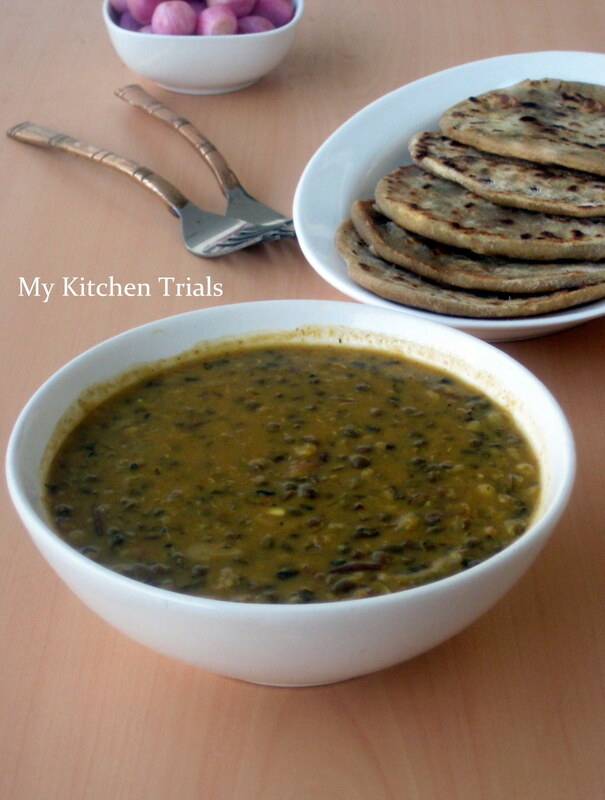 necessity is the mother of invention – you just created a new dal! Haha…this happens often doesn’t it? But the innovation is great…i’m a fan of sambhar powder in everything…even dal makhni! LOL….but your presence of mind of adding sambar powder is what’ll make you the innovative cook. Now I want that fork for sure.